As a specialist in treating sports injuries without drugs, I see many patients with tennis elbow, otherwise known as lateral epicondylosis. Many of these patients have already tried conventional medical treatment, including prescription anti-inflammatory drugs, such as naprosyn or celecoxib, and cortisone shots. They come to me because drugs don’t help and can make the condition worse. In fact, cortisone shots are no longer recommended as a treatment because they are harmful in the long run. I work with my patients to relieve their pain and get them back on the tennis court using a two-pronged approach: Soft-tissue treatment and nutrition. For the soft tissue treatment, I rely on two very successful modalities: Active Release Technique (ART) Injury Care, combined with low-level laser therapy. ►Acute conditions: Pulls, tears, collisions, etc. Each of these factors can cause your body to produce tough, dense scar tissue in the affected area. This scar tissue binds up and ties down tissues that need to move freely. As scar tissue builds up, muscles become shorter and weaker, the tension on tendons causes tendonitis, and nerves can become trapped. ART Injury Care uses precise techniques to resolve soft-tissue injuries by removing the adhesions and restrictive tissues that are laid down when the tissue suffers repeated trauma. 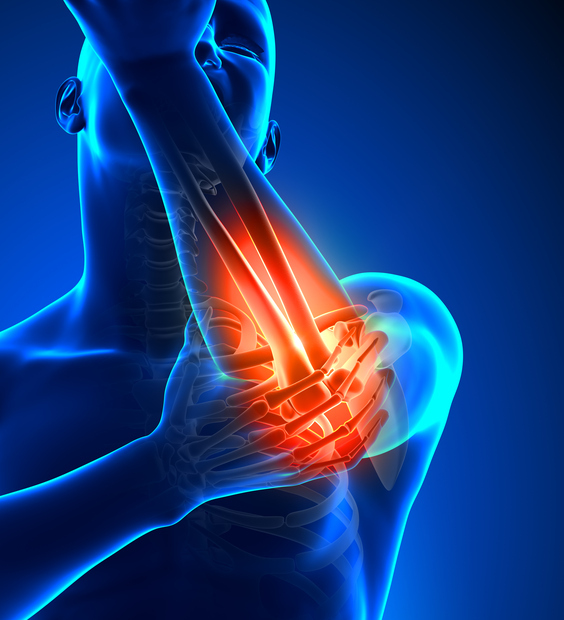 In the case of tennis elbow, the result is pain and reduced range of motion. Sometimes, a nerve becomes trapped in the tissue, leading to more pain, tingling, numbness and weakness. Because repeated trauma is usually the root cause of tennis elbow, ART can be extremely effective for restoring full function and movement. When I work with patients using ART, I use my hand or thumb to evaluate the problem area and guide the patient to move that part of the body through a specific range of motion. The process helps break up scar tissue and lets the area move freely again. I find ART gets my patients back in the game quickly, usually after only six to eight 15-minute office visits. I like to combine ART with Low-Level Laser Therapy (LLLT). This treatment works by exposing the injured tissue to coherent light at specific wavelengths—in other words, laser light. The light passes through the skin and reaches the damaged soft tissue painlessly and with no sensation of heat. The stimulation from the light triggers a biological response that switches on the healing process. The injured area is stimulated to produce a cascade of natural chemicals, such as anti-inflammatory enzymes, that reduce pain and improve mobility in the joint. LLLT treatments are quick, usually taking less than five minutes. It’s so effective that the prestigious British Journal of Medicine includes LLLT in its clinical evidence recommendations for tennis elbow. I’ve found that when I combine ART and LLLT, my patients feel pain relief in the arm and elbow very quickly. Within a few weeks, their pain is usually entirely gone and they are back to playing with no restrictions. In addition to removing these foods from your diet as much as possible, increase your intake of fresh fruits and vegetables, nuts, whole grains and fatty fish, such as salmon.